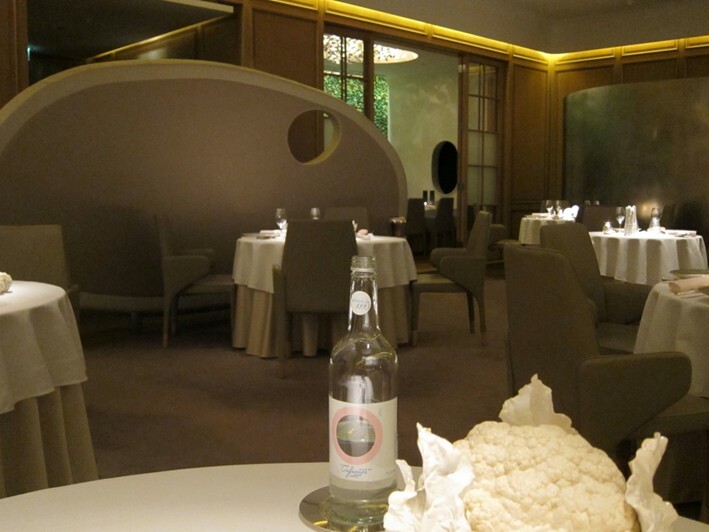 Alain Ducasse at The Dorchester opened in 2009 – indeed I ate here on the opening night. 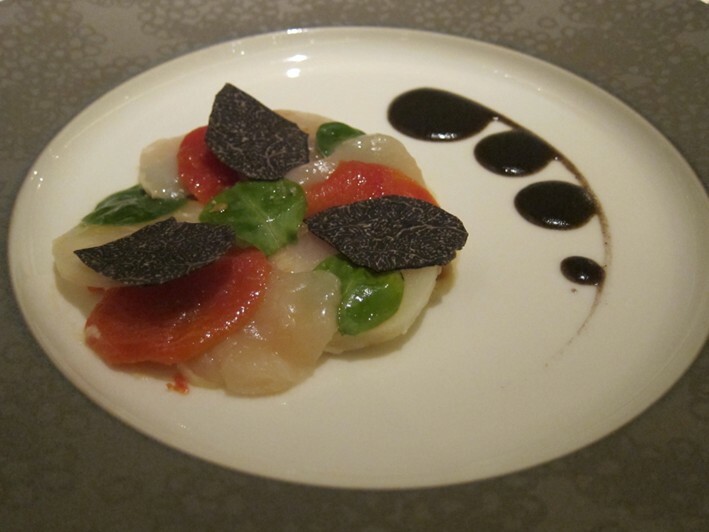 Michelin granted it two stars straight out of the gate and then gave it the ultimate third star accolade in 2010, despite all evidence to the contrary. 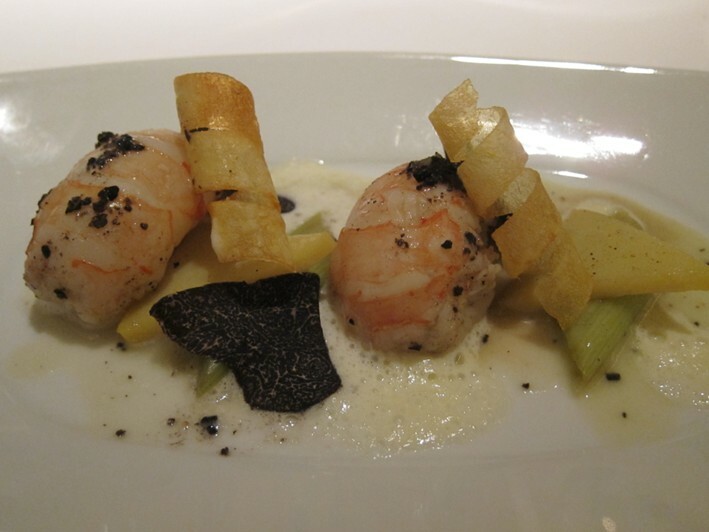 The executive chef since January 2016 has been Jean-Philippe Blondet, who worked here as head chef from late 2013 and prior to that worked in assorted Ducasse restaurants, from Spoon in Hong Kong through to Louis XV in Monaco, near his native city of Nice. 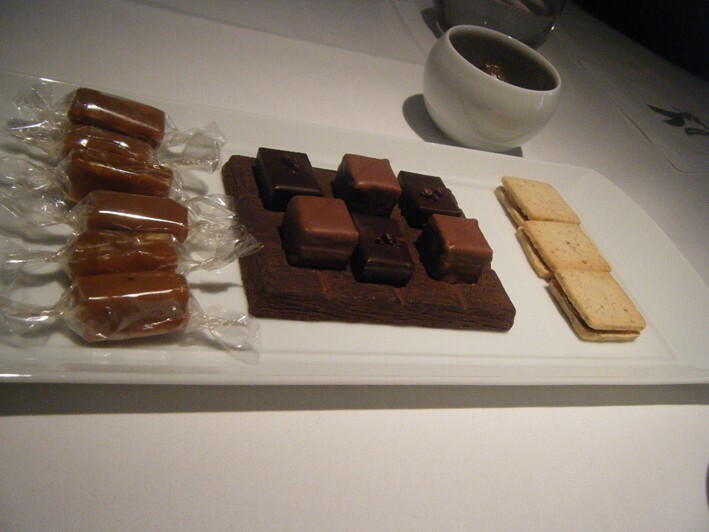 Three courses cost £105 and four courses £125, or there was a seven course tasting menu at £145. 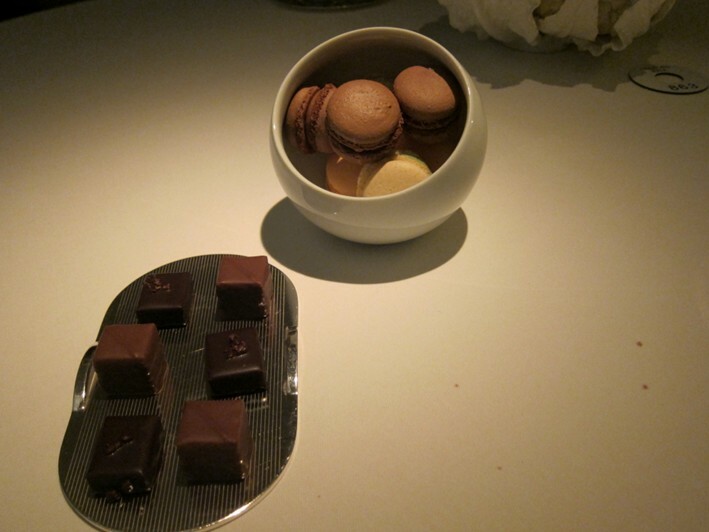 This is actually a fraction the price of a Paris three star restaurant, but the question remains as to whether the experience here really compares. As we shall see, though, their wine list gives ample opportunity for them to recoup some money. The wine list is very extensive, with 1,066 bottles, but is also extremely expensive in both absolute and relative terms. Bear with me with a more detailed than usual discussion of this lengthy list. The list is unsurprisingly dominated by France, with 76% of the bottles, but there are still hundreds of bottles from elsewhere, including from Slovenia and Greece. Yet it seems odd that there is room in such a long list for red wines from Austria, but not for a single dessert wine outside France (it turned out that there was in fact an unlisted Kracher beerenauslese), nor for a single wine from South America. Clearly there will be plenty of luxury wines here, but what about those seeking value? To be sure, there is a token wine at £30 and five more under £50, but the median price of a bottle is a hefty £220. There were more wines in the £500-£750 range than ones under £75. Mark-ups range from high to excessive. A Chateau d’Yquem from the sub-par and past its peak 1980 vintage retails at £413 yet is listed here at a crazy £2,750 (plus service), a little matter of 7.5 times the retail price once you add in service. Any one daft enough to buy this is contributing a cash margin of £2,681 to the restaurant, and that assumes the retail price, which of course is more than they would actually have paid. Not bad work for opening a bottle and pouring it into a glass. This was not an isolated aberration, with the typical mark-up level at around 3.5 times the retail price, which is very high even by the inflated standards of Mayfair. Bargain hunters will struggle with the list, though the E. Pepe Montepulicano d’Abruzzo1994 at £380 is what passes for value here, with a price of merely 1.75 times its shop price of £244 and a cash margin of a mere £184 once you take service into account. If you think you will find relief in obscure corners of the list, which is usually a good strategy, you will be disappointed. The excellent Egon Muller Riesling Scharzhoberger Kabinett 2008 can be found in shops at £95 yet here is listed at £395, a little matter of 4.7 times its retail price once you add service. Similarly the very pleasant Hungarian Szepsy Dry Furmint 2011 costs £31 in a shop yet is priced here at £160, a 5.8 times mark-up once you add service, for what is after all a fairly obscure wine. It is a pity that what appear to be pricing errors are not uncommon: Stonyridge Larose 2016 at £590 is around 3.5 times its £192 shop price once you add service, yet the identical wine from the lesser 2014 vintage is an absurd £995 for a bottle that retails at £114, nearly ten times its shop price. This is a list for people who have expense accounts or rich friends treating them rather than for the normal wine drinker. Corkage is not offered at any price. The dining room is smart, with large and widely spaced tables, the carpet meaning pleasingly low noise levels. 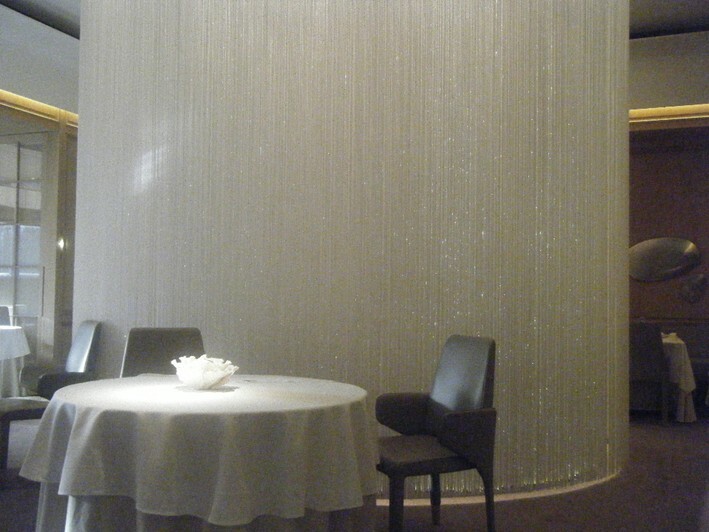 There is a shimmering luminescent curtain enclosing a single private table. 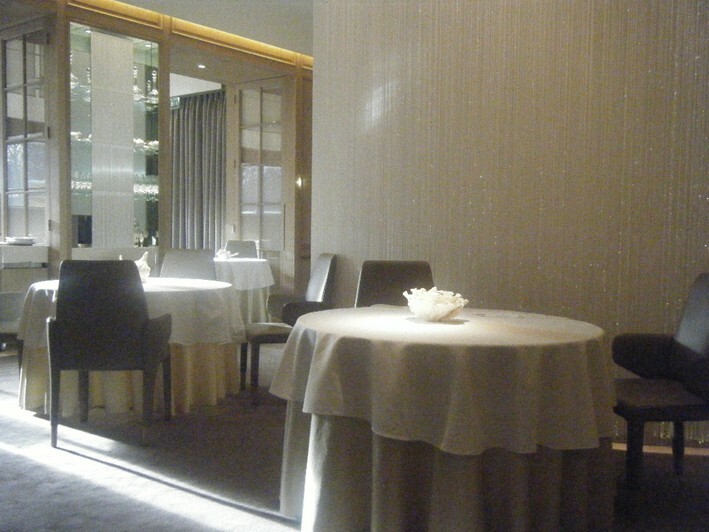 The lighting in the room at night is gloomy, with some directed lights that fail to illuminate the tables properly. 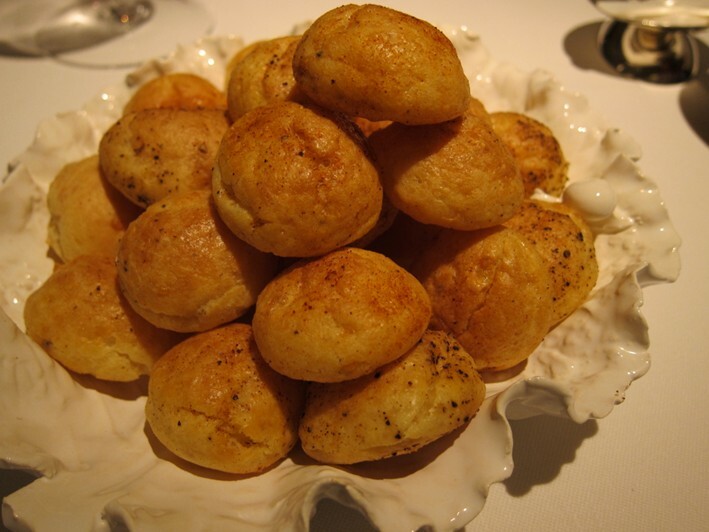 A little heap of gougeres began the meal, made with Emmenthal cheese. 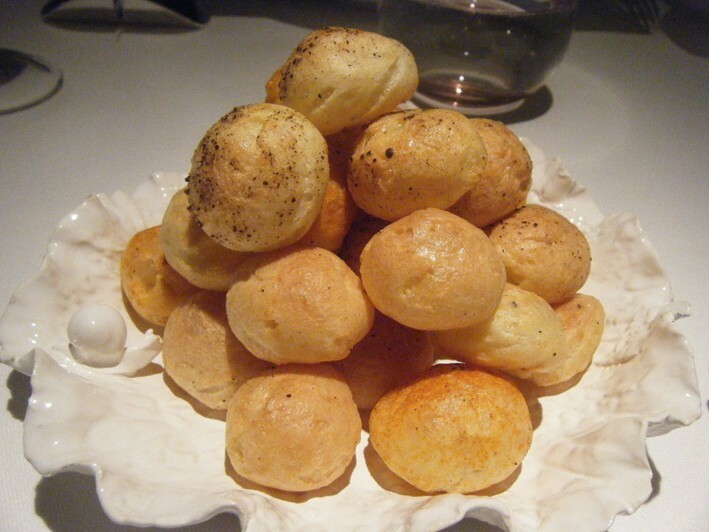 Although they were neatly piped and had good texture, the cheese flavour was quite limited, and cold gougeres are never as good as warm ones. 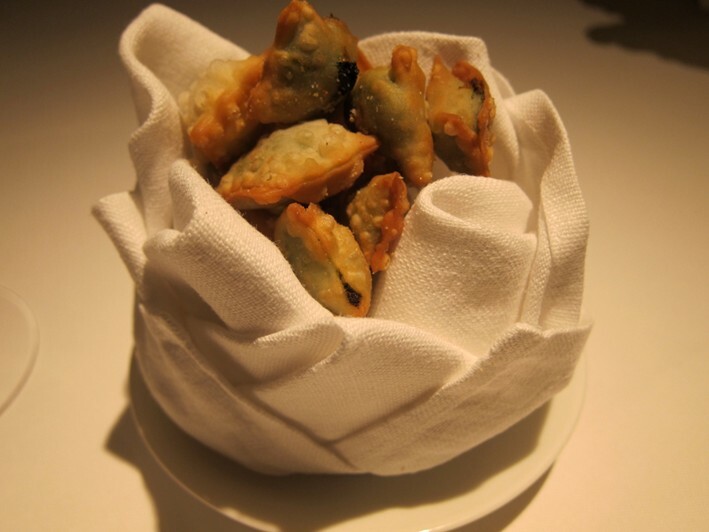 Better were barbajuans, the little parcels of Swiss chard and ricotta that are a speciality of the French Riviera and served at Louis XV. 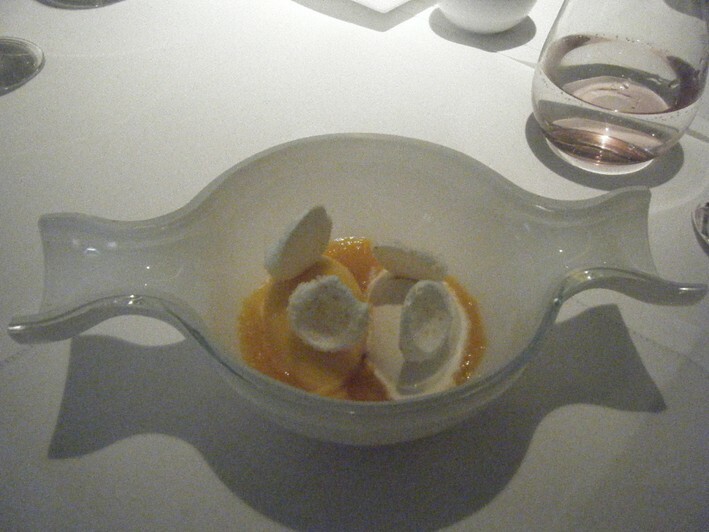 These were hot and tasty and compensated for the rather lacklustre gougeres (average 15/20 nibbles). Bread was very good, made from scratch in the kitchen. There was fugasse with bacon, soft white roll with lardo, olive bread and baguette (18/20). 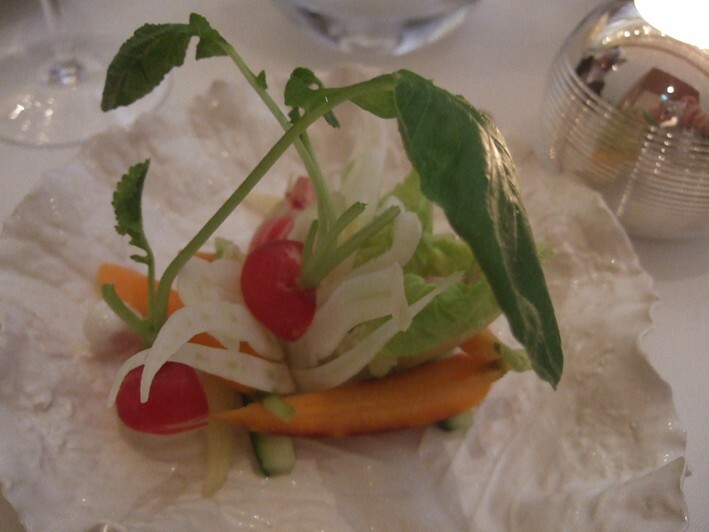 A little amuse bouche of radish, hazelnut and beetroot salad was pleasant, but not something to get the pulse racing. It was a competent salad, but nothing more (barely 14/20). 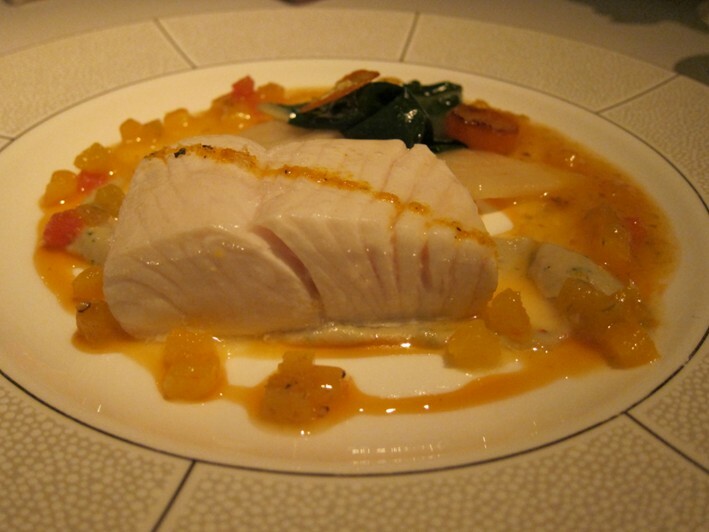 Incidentally, dishes like this are where we see a difference between vegetable quality between the UK and the south of France, or indeed Japan. If you made the same dish with stunning produce from the markets of the Riviera (or Tokyo) then it could be quite exciting, but this version just tastes ordinary. Dorset crab with celeriac and caviar had nice enough crab, but its flavour was rather overpowered by the earthy celeriac. A nice touch was the little pieces of deep-fried soft-shell crab, which had plenty of flavour (15/20). 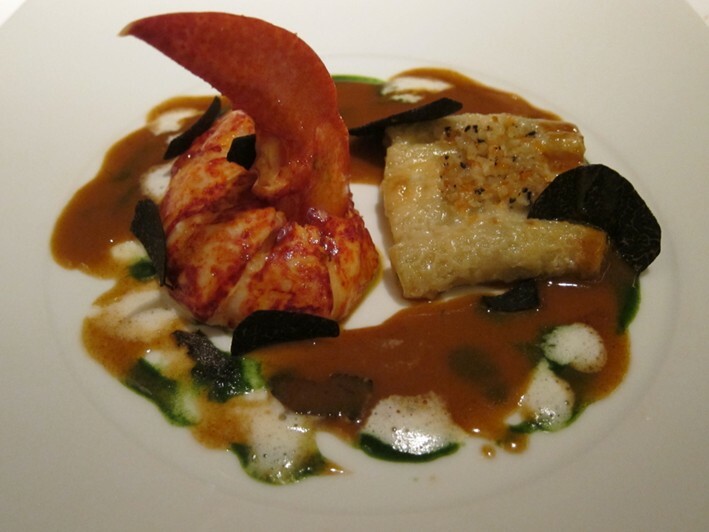 Lobster with truffled chicken quenelles was quite a classical dish and worked well. 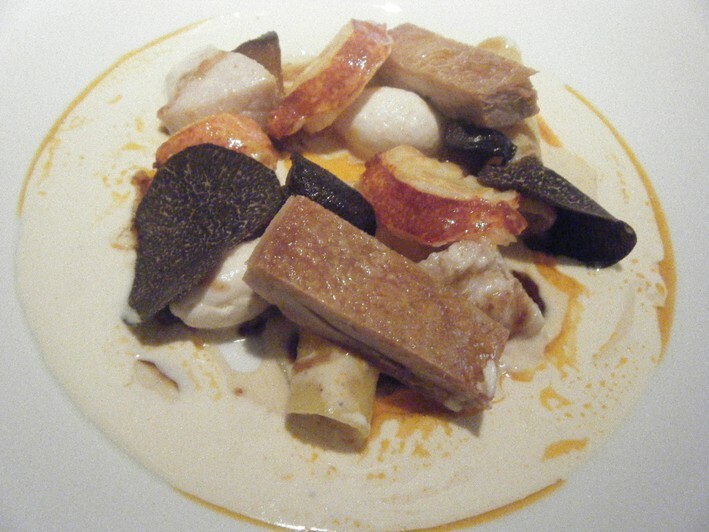 The lobster was tender while the quenelles had good texture and plenty of earthy scent of truffle (17/20). 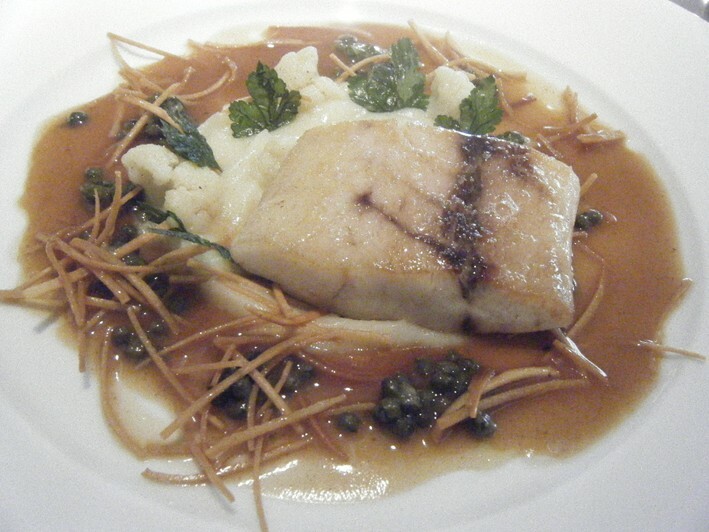 Dover sole with watercress and hazelnut was good, the fish nicely cooked and the fillets coming from a very large 800g (28oz) specimen, about twice the size that usually appears on restaurant tables (16/20). This came with a side dish of excellent salt-baked potato with hazelnut and watercress butter, which may not sound thrilling but actually had gorgeous flavour (18/20). 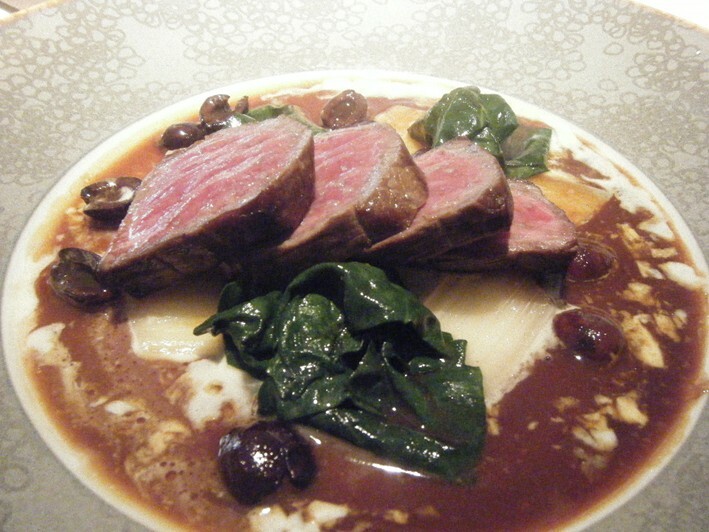 Venison came as both saddle and rib, with parsnip and peanuts. 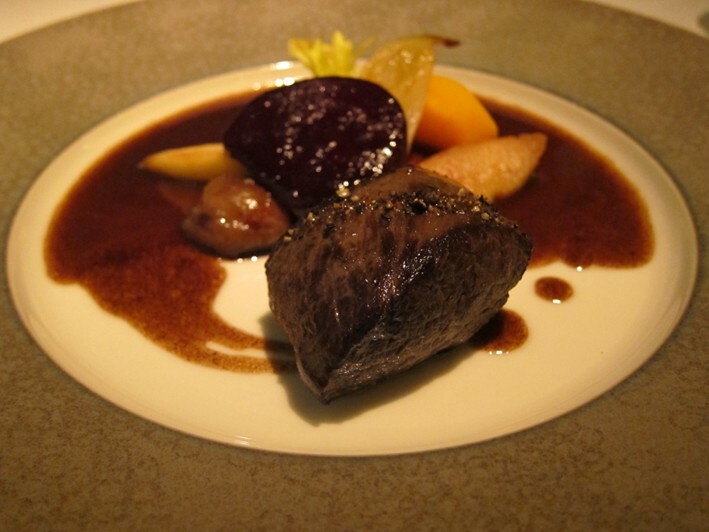 The deer had good flavour and was cooked medium rare, though parsnip didn’t seem to me the most natural accompaniment. 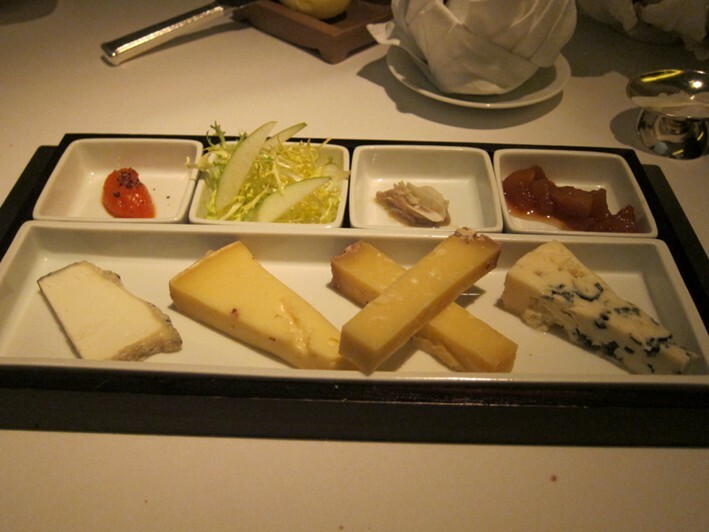 The overall effect was quite rich, and could have done with a lighter or acidic component, such as a green salad with a quite sharp dressing to balance the richness of the meat (16/20). Although it was not the dish I chose, a nice Anjou pigeon main course was not improved by a strange aubergine with lemon balm accompaniment, which seemed to both myself and my dining companion (an experienced chef) very odd indeed and borderline unpleasant to taste. 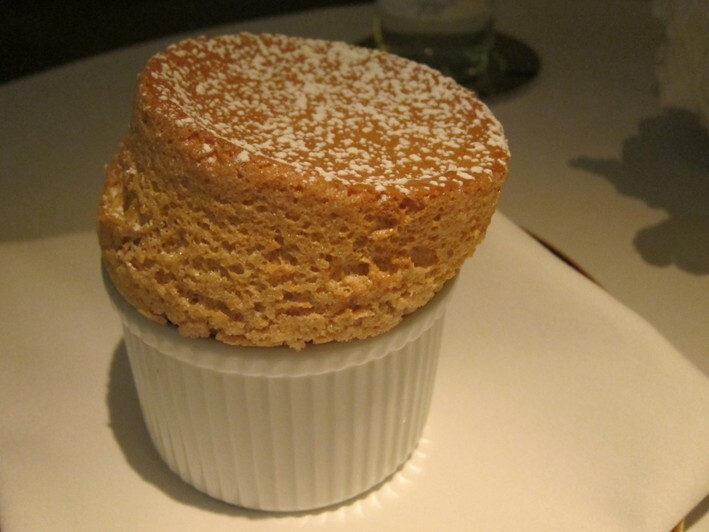 Hazelnut soufflé lacked sufficient hazelnut flavour, though it had risen nicely and was evenly cooked (16/20). 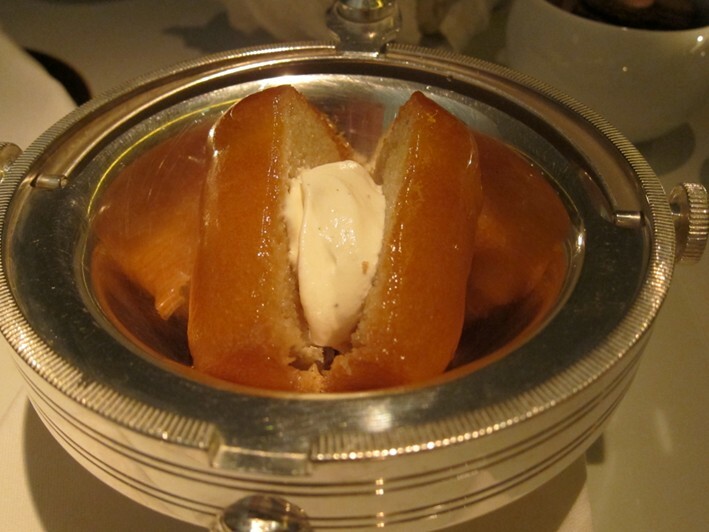 Better was the classic rum baba, a Ducasse signature dessert with Chantilly cream and a choice of rum. 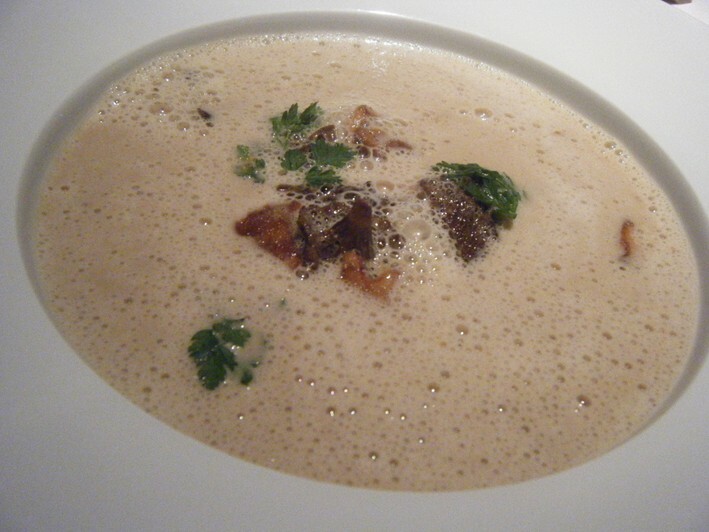 This is a tricky dish to get right as the baba can easily dry out, but here it was lovely (19/20). Coffee was the Opus blend from Alchemy Coffee near Blackfriars. This was a mix of beans from Guatemala, Honduras and El Salvador, which apparently are lightly roasted, the result tasting very pleasant. Interestingly they serve this rather than Ducasse’s own coffee brand , which has a dedicated shop in King’s Cross. 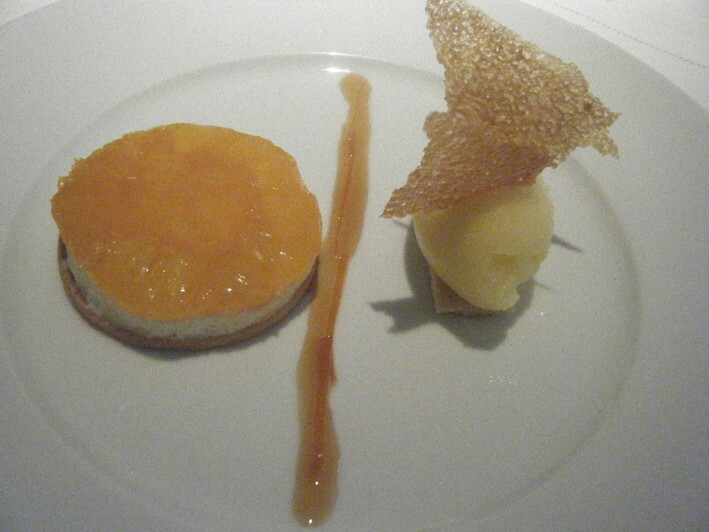 Service was silky smooth, the staff charming, and the bill came to £192 with wine and coffee. 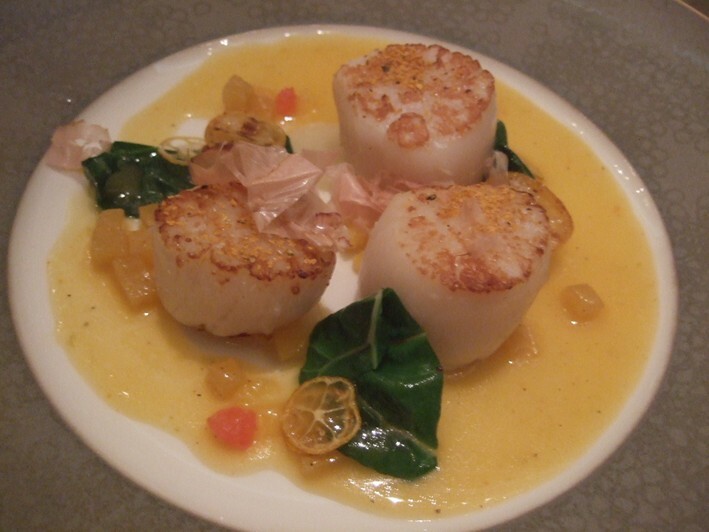 A typical cost per head for three courses and drinks might be around £160. 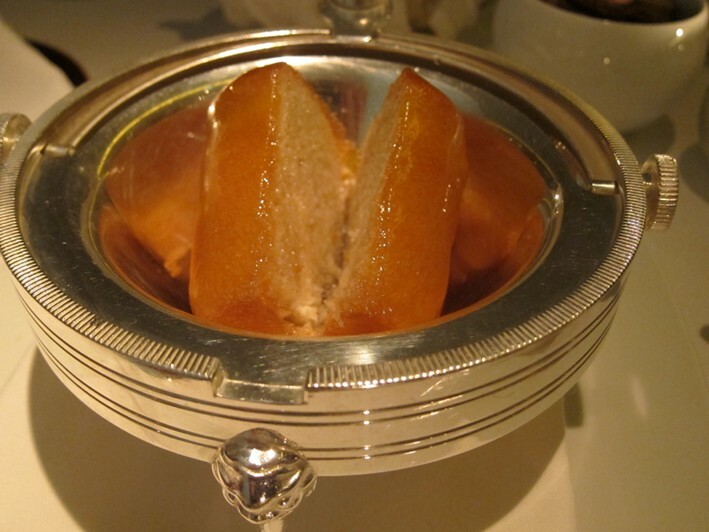 As at previous meals, the strengths here are the classic desserts like rum baba, and the kitchen technique is strong even though ingredients are of good rather than dazzling quality, especially if you compare them with a three star restaurant in Paris. To be fair, the food pricing is not excessive, the tasting menu here being the price of a starter at some Paris restaurants, but of course the wine list is exceptionally expensive. 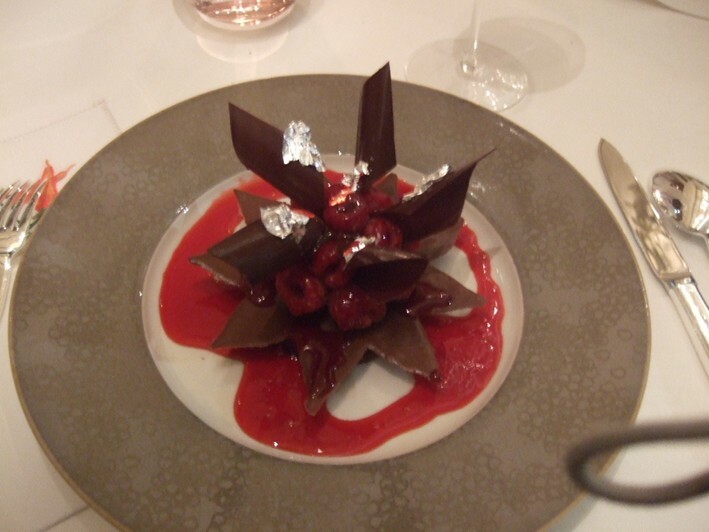 The overall experience with its lovely service is enjoyable enough if you don’t think of the bill, but it seems to me a long way off true three star standard. The meal tonight had more inconsistencies tonight than at previous visits, and that shouldn’t really happen at this level. Totally agree about this not being up to 3 Star standards. 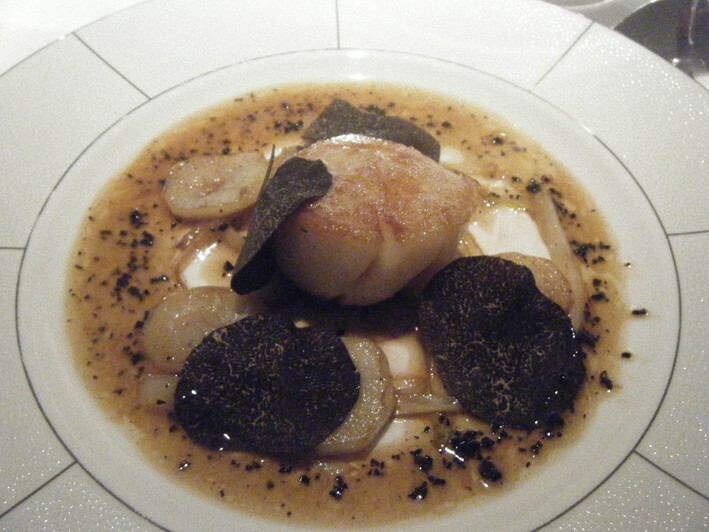 Although ‘cheap’ compared to Paris 3 starred restaurants the standard is know where near as good. 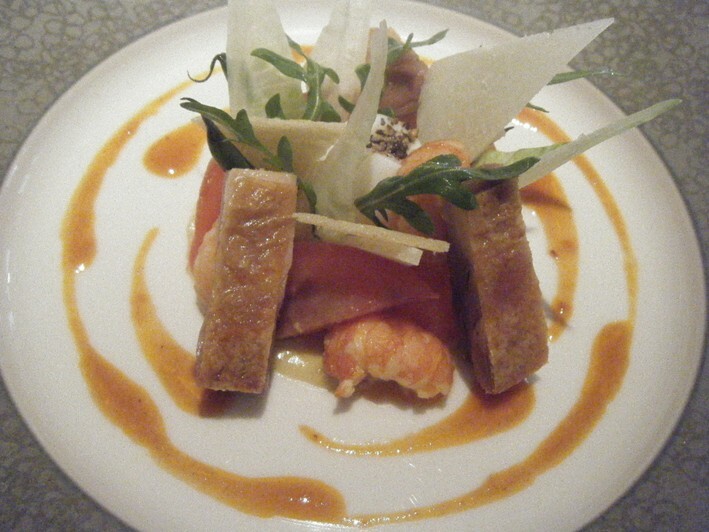 There are much better 2 (and even 1 star) restaurants in the uk. The food was good but way off perfection. Really don’t get how it can get 3 stars unless you get bonus points for the name of the ‘chef’.